These seemingly ordinary undead can transform into an abyss-corrupted monstrosity. Further confirming the Abyss as their affliction, they are known to be weak to the Farron Greatsword and Wolf Knight's Greatsword. When killed, they commonly drop Dark Gems. 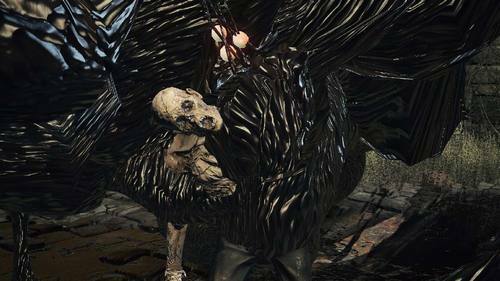 These poor creatures are related to the Abyss, which corrupts both living creatures and the land itself, which is what happened to Oolacile (in Dark Souls 1). The very name for these creatures lends some evidence towards them being literal manifestations of human essence that has gone wild in the absence of a soul, like Manus. Manus, the Father of the Abyss, was noted to have turned into a monstrosity when his 'humanity went wild', and so became the source of the Abyss and the corruption it spread across the land. Because of this, the Pus of Man may be an advanced stage of the Abyss corrupting a living being, as humans are especially vulnerable. Manus had similar black ooze on parts of his body, and he was entirely corrupted by the abyss. Due to being the oldest being to first be corrupted by rampant humanity, and consequently being the first being to be corrupted by the Abyss, he has a much more defined yet still monstrous form than the Pus of Man creatures do. Artorias as well has corrupted armor and a massive aura of dark energy emanating from him due to being corrupted by the Abyss because of Manus, and the implication of him devolving into a feral beast seems to show that humanity in the absence of a soul will run rampant and corrupt living beings. So what does this have to do with the Pilgrims from Londor? The pilgrims chain massive shells to their backs in order to contain the Abyss corruption happening to their bodies, and the serpentine form the Pus of Man creatures have hint at them being imperfect monstrosities, as in Dark Souls lore the serpent is seen as a imperfect form of the dragon and is also a symbol of the undead. So, the Abyss corruption seems to happen to humans who have hollowed and lost their souls, with only their humanity filling the void as a result and growing wild, becoming imperfect monstrosities that may be attracted to souls. Over time these creatures may even become something else entirely, created from humanity itself as the Abyss was. The birth of these creatures may even be related to the general ending of the Age of Fire as the Abyss takes over the world piece by piece when the flames go out. Greatsword of the Abyss watchers which is atypically paired with a dagger. The dagger is utilized as a wedge in the left hand while the greatsword is held in the right, a unique technique that was synonymous with the Undead Legion. Confounds foes the manner of wolves hunting prey. Greatsword of Artorias tainted by the dark of the Abyss, and master of the wolf's blood of Farron. The wolf knight was the first Abyss Watcher, and his sword is more punishing against creations of the abyss. A gem of infused titanite. Born of disembodied humanity. Used in infusion to create dark weapons. Dark weapons inflict dark damage, and scale with faith.